Welcome to your local Cats Protection. Welcome to Caterham, Redhill & East Surrey Cats Protection. We take in, rehome and neuter cats in the East Surrey area. The branch is run entirely by volunteers who are dedicated to improving the lives of cats and kittens in our area. Our site is updated regularly to make sure we provide up to date information on our cats and branch activities. 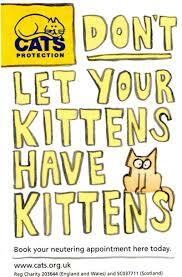 Did you know we run a free neutering scheme for anyone living in our postcode areas - RH1, RH8, RH9, CR3, CR5, CR6? If you're on benefits, have a low income or are simply struggling to make ends meet we can help. It's important to have kittens neutered at 16 weeks of age before they start breeding, and it's better for their long term health. Older cats can be neutered too - it's never too late! We'll find a vet close to where you live and we can help with transport if needed. To find out more just drop us an email at neutering@eastsurrey.cats.org.uk or call us on 0345 371 2739 and leave a message in mailbox 4. We'll usually get back to you within 24 hours. Like us on Facebook to keep up to date with the cats that are currently looking for homes. Watch our YouTube Channel to see up to date video clips of our cats looking for homes. View more photos & videos of our cats that are currently looking for homes.